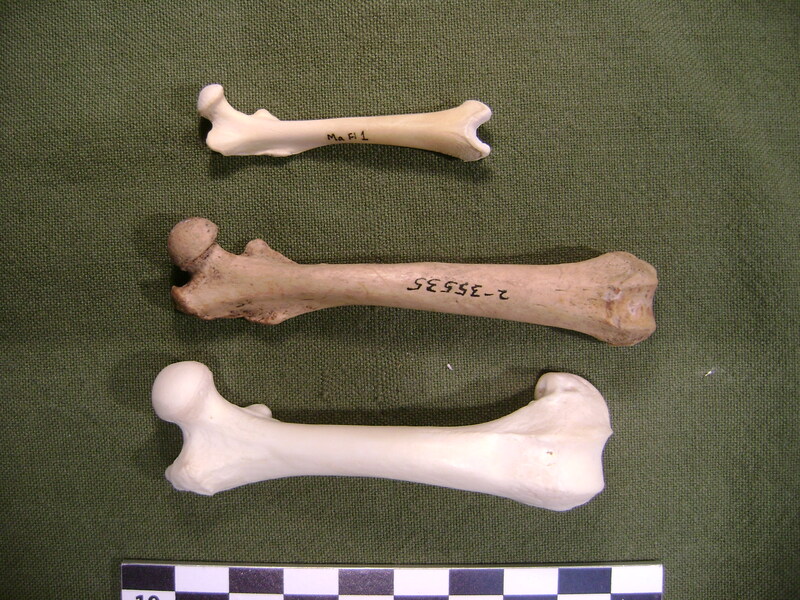 Years ago, when I was the archaeologist for Admiralty Island National Monument, I was surprised that several marmot bones were reported from Daxatkanada, an archaeological site first excavated by Frederica de Laguna in 1949-50 and later re-investigated as part of my dissertation. Having worked on Admiralty Island with knowledgeable biologists, I had learned that marmots do not occur naturally on any island other than Douglas Island (near Juneau) in the Alexander Archipelago (see also McDonald & Cook 2009:67-70 Recent Mammals of Alaska). Back then, I suspected that the original identification was in error, but during 2014, I had the privilege of examining the faunal remains recovered by de Laguna that now reside in the Hearst Museum of UC Berkeley. What you see in the photo is the archaeological specimen (a femur) in the center, compared to my juvenile yellow-bellied marmot (Marmota flaviventris) above and a land otter (Lontra canadensis) below. Unfortunately, I don’t have a an adult M. caligata to compare. This femur and other specimens from the site really do appear to be marmot. So we must infer that somebody at Daxatkanada was in the possession of the bones of a marmot or two. The question is why? Heaton and Grady (2003) found M. caligata in Pleistocene fossil assemblages (dated to 26-27,000 years ago) from Prince of Wales Island. Could marmots have been more widespread throughout the Alexander Archipelago during pre-contact times than during the 20th century? Did Tlingit ancestors curate and transport marmot bones from the mainland to Admiralty Island? Were whole marmots traded to the islands? If the skins were valued, I wonder why the bones show up… marmots do not seem like they would be highly desired food animals, but then, I have never tasted marmot. I was recently on an Alaskan hunting forum and there was a whole thread about eating marmots. I gather they are quite tasty.